Being Frugal and Making It Work: Snipe Hunt - It's All Fun and Games! Snipe Hunt - It's All Fun and Games! Have you ever hunted for a snipe or sent an unexpected victim on a snipe hunt? I remember sending my "city cousins" on a snipe hunt when they came to visit us as kids, it was hilarious! If your family enjoys spending time in the outdoors camping or if your children are in the scouts, chances are you have heard of the mythical creature of the forest, the Snipe. A tradition passed down through the generations, the Snipe Hunt originated as a tall tale told by parents and teens to younger children. Unsuspecting children are told about an animal called the Snipe and the unusually preposterous method of catching it, such as running around the woods carrying a bag or making strange noises such as banging rocks together. As children set off in search of the Snipe, their elders take in the antics and try to contain their laughter. Traditionally nothing more than a campfire prank, Education Outdoors has transformed the story of the Snipe into a new game called Snipe Hunt. 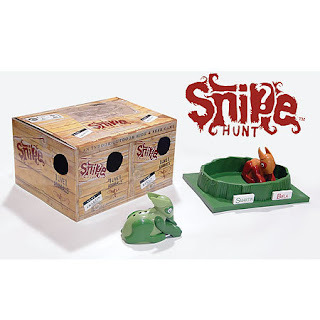 Snipe Hunt is the perfect game for children (and adults) of all ages! It is the perfect sleepover and camping game! It is fun and exciting, lots of laughs to be had by everyone who plays or watches the snipe hunt take place! Snipe Hunt is an indoor or outdoor game of hide-and-seek where players try to be the first to find their opponent’s Snipe and return it to its nest. Each team turns their Snipe on and disappears to find the best hiding place for them. In five minutes the Snipes will begin chirping and their eyes will start flashing red so teams must hurry to get back to the nest before the Snipes give away the direction they are hiding. Have you ever been sent on a Snipe hunt? hahaha. I grew up in a beach town, and maybe it's different there, as a snipe hunt was what you did in high school when you wanted to make out in the car while parked at the beach. I must live under a rock. I've never heard of this, but it sure sounds fun. I've never heard of this, either! It sounds like so much fun!